England's Josh Warrington retained his WBC International featherweight title with victory over Hisashi Amagasa in Leeds on Saturday night. 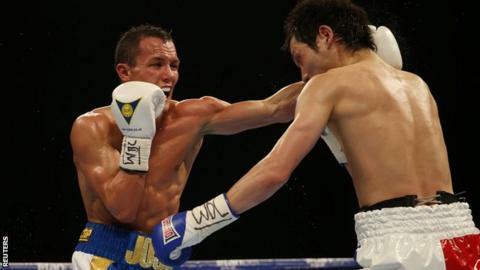 Warrington was awarded a unanimous points decision against the taller, more experienced 30-year-old Japanese fighter at the First Direct Arena. It meant he extended his record to 23-0 in front of the home crowd. The 25-year-old said he now wanted a shot at Wales' IBF world featherweight champion Lee Selby. "I think when that comes round I've got what it takes to beat him," he told Sky Sports. "I'm desperate to chase that world title but need to polish up on a few things first." Stuart Hall will fight for the IBF bantamweight title after defeating Mexico's Rodrigo Guerrero in their final eliminator match. The former IBF champion secured the 20th win of his career by unanimous points decision on the same bill. The 36-year-old could face Lee Haskins, who defeated Hall in 2012, if the southpaw successfully defends his title against Ivan Morales in Cardiff in May. Martin J Ward remains undefeated after defending his WBC International super featherweight title with a unanimous decision over Ruddy Encarnacion.